Since Halloween is approaching soon, my fellow bento bloggers and I are having a Halloween blog hop! It will be so much fun hopping, getting ideas and enjoying all the Halloween lunches. Here is my ghost bento that I recreated from my last year's lunch. Grapes and strawberry slices watched over by a ghost pick. Sweet bell peppers carved into jack-o-lanterns above bed of lettuce. Ghost shaped sandwich topped with provolone cheese, eyes and nose are made from nori with fruit leather letters. Smaller ghosts are from mozzarella string cheese cut into half with sharp paring knife and food safe marker for eyes and nose. Packed in an Easylunchboxes container. Click to check out the next one from Keitha at Keitha's Chaos or click on the image below. Keep celebrating by hopping through the rest of the Blog Hop. Those mini pepper 'pumpkins' are so cute! One of those 'wish I'd thought of that' ideas! Your ghosts are so cute! Love them! I love the string cheese ghosts! Great idea! Your string cheese ghosts and bell pepper jack-o-lanterns are adorable!! Love the ghosties! And those peppers are fantastic! this is a great lunch - everything is so cute! Such a healthy and fun lunch! I love your ghosts and jack o' lanterns! 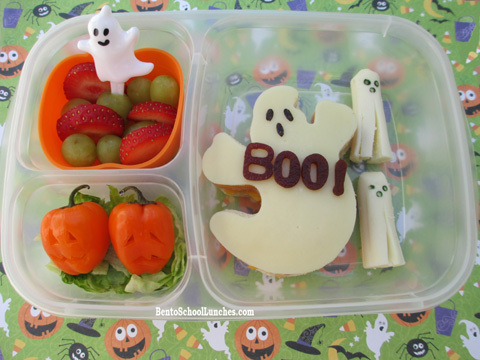 Love your ghost bento and especially the pepper jack 'o' lanterns ~ they are so cute! Love your ghosts... and always love your lunches! Rina cute job, like you always do!! And I want tiny, adorable peppers to make into perfectly cute Jack-o-lanterns!!! So wonderful! It's all so cute. Really like the little peppers. The peppers are my fav too! oh my gosh, SO cute Rina! The bell peppers are fabulous! Awww... your lunch so cute! I don't know if my kiddo will eat them, but I am going to have to go find some tiny peppers, yours look great! The bell peppers are so great! Great job on the sweet bell peppers! I love the expressions on the pepper pumpkins! Love those ghosts! So cute!! Very creative ghosts!! Love them! Love your ghosties!! Amazing job! Your peppers are so sweet, love your lunch! What a great idea with the cheese sticks! Love it! Never seen bell peppers that small before. Lovely lunch! such a pretty lunch!!!! Love it! Love the whole lunch, Rina but especially those carved peppers!